Ever See the Movie Holes? I think all of mine are rising from the grave like some zombie film. 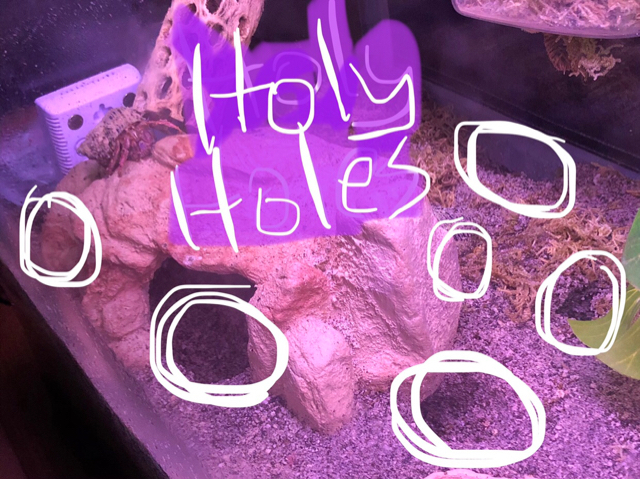 Just look at all those holes!!!! I wish they would all be awake at the same time so I can see them all together. Here is the current state of half of my tank. Re: Ever See the Movie Holes? Maybe one of them lost a shell and everyone is trying to find it! I call then little dozers sometimes the way they can push everything out of the way. In the summer I counted 16 or 17 holes dug by 6 crabs in 2 days! At least they are happy! Yeah, I always wonder how many underground tunnels they have.